The Impress ($39) is a new, Kickstarter funded, all-in-one coffee brewer; the sort that lets you brew and drink from the same vessel. It’s made of three parts–a stainless steel double-walled tumbler, a stainless inner press that has a metal filter & silicone seal on the bottom, and a soft silicone lid that presses on to the top. The basic idea is that you steep your coffee and then press the inner filter down to trap the coffee at the bottom, which leaves filtered coffee in the inner chamber. if you use it as directed, it’s basically a triple-walled insulated mug, and it keeps your coffee piping hot as long as you don’t open the lid – mine was still undrinkably hot after an hour long car ride. This can also be a drawback if you’re thinking of sipping it on your morning commute; I tried and it burned. But if you want hot coffee at your destination, you’re good to go. 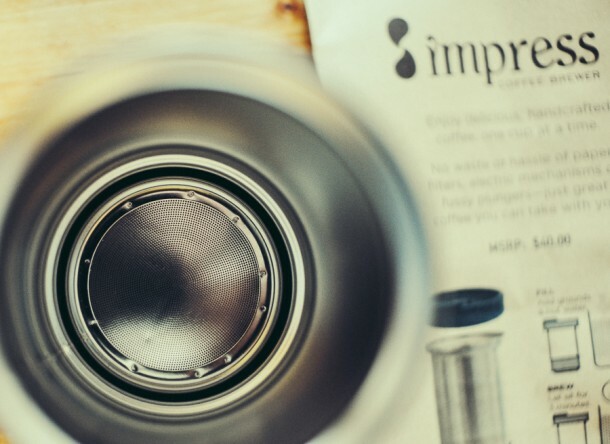 The higher cost ($39) of the Impress is close to what you’d spend on an Aeropress and an aftermarket metal filter like the Able Disk Filter or Kaffeologie S Filter . It is easier to clean than a French press, but still not as easy as an Aeropress, so that’s a draw. However, few coffee geeks use the Aeropress the way it was originally intended, and I feel like the Impress is ripe for similar innovation. For instance – why plunge and trap the coffee at the bottom, where it can still extract a bit every time it’s sloshed around over time (even if this is minimized by design) when you can just as easily brew inside the inner filter and simply pull up when you’re done? This also makes cleaning a lot easier, as the filter unscrews from the end. A few other hacks immediately came to mind. For one, this might work best as a cold-brew travel mug. 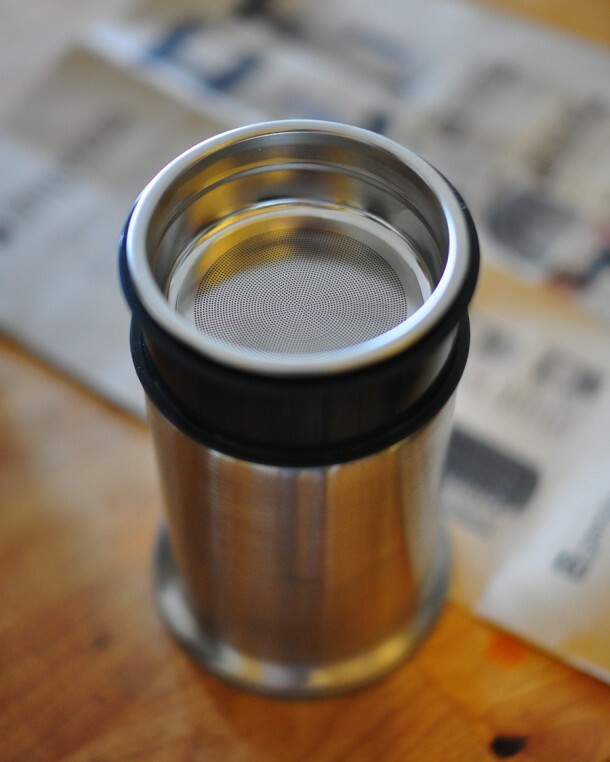 Instead of using the inner chamber to trap the coffee in the bottom, brew it in the removable part and just pull it out when you’re done brewing, leaving you with cold, filtered coffee in an insulated travel container. I’d also consider this a nice loose-leaf tea brewer, if you don’t mind the stainless steel. If you steep with the inner chamber plunged, then you can simply remove the tea leaves and use the removable filter to hold them for a second or third brew. 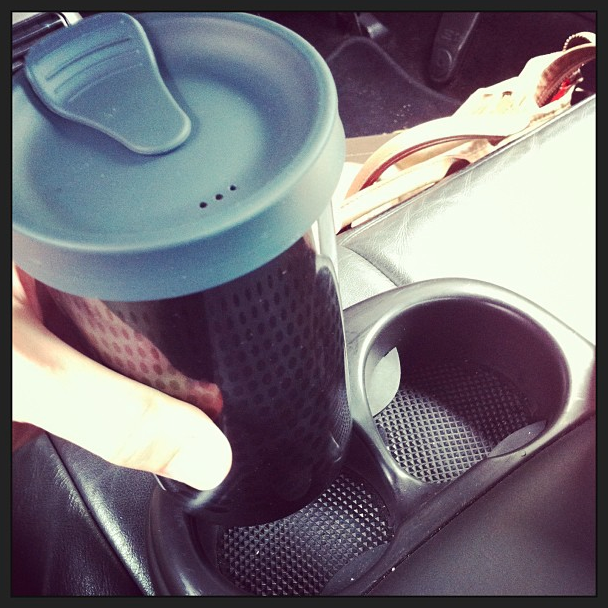 Unfortunately, and strangely for a portable coffee cup, the Impress doesn’t actually fit in a cup holder. Maybe it will work if you have one made for a big-gulp cup, but if you have standard sized holders, you’re out of luck (Above, you see me trying to stow it on a recent business trip… no luck, had to hold it the entire time! So much for getting some work done on the ride over). The Impress is well made with sturdy components. 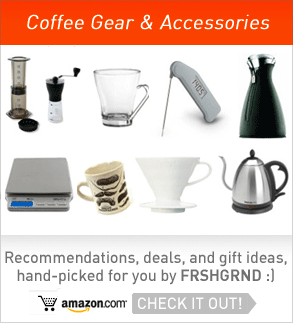 It really does keep your drink very hot, and it does remove a step or two from your brewing routine. 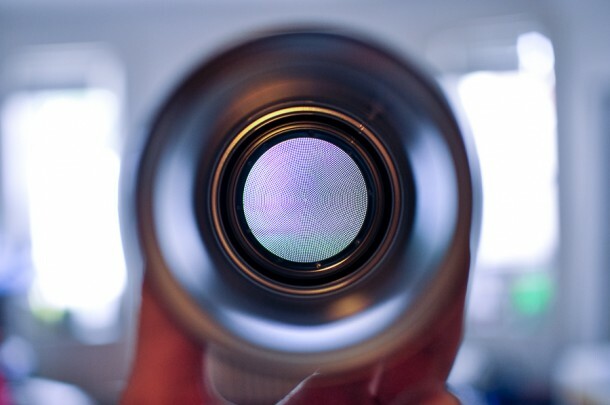 The removable filter also suggests future accessories, the first of which will hopefully be a finer mesh. However, its main draw–portability–is undercut by a lid that isn’t water-tight or super secure (you can’t toss this in a bag to carry around for later), and by not fitting standard car cup-holders. Ultimately, this is a product that I’m sure will fill a niche for some coffee drinkers who have specific situations where these features will make life easier for them. For the rest of us, it may have appeal for hacking (cold brew, tea, and who knows what else someone can come up with), but as of yet, doesn’t really cross the threshold from novelty to must-have. Have one? Have an opinion? Sound off in the comments! Great review! 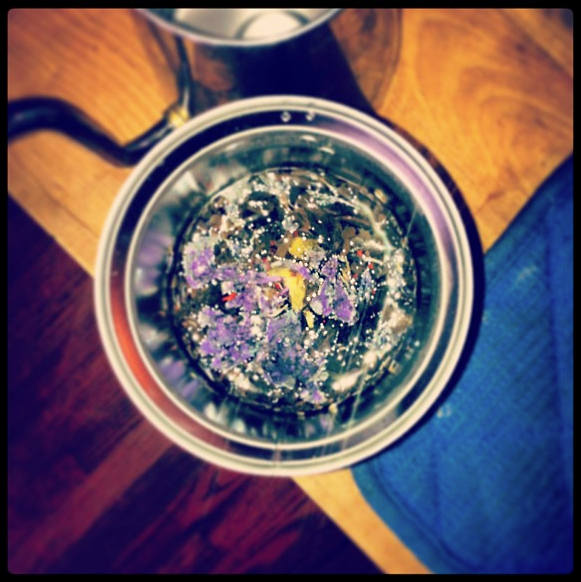 How does the level of sediment compare to a traditional French press? What about the walkure brewers? I love seeing this kind of innovation, but am a much bigger fan of cloth/paper filters. Fits great in the main, center cup holders in my 2011 Honda Odyssey. Fits in my Ford Fusion cupholder just fine. I loved this cup, it’s been used approx. 15 times, but all of a sudden it’s difficult to push the insert in, once you finally get it to the bottom and start drinking, now it has started leaking from underneath the bottom of the lid prior to takin a sip! This happened all of a sudden, directions said that the two stainless pieces (outer cup & insert) could be cleaned on top shelf of a dishwasher so I’ve been doing that. I never added the flexible plastic lid though, that’s always been cleaned by hand. HELP! I’ve ruined one blouse due to this leak. Can I buy a new cap for it somewhere? Is that’s what’s wrong? Hi Linda, sorry to hear that – I would definitely reach out to Impress to see if they can solve your issue; maybe a replacement for the lid will help? 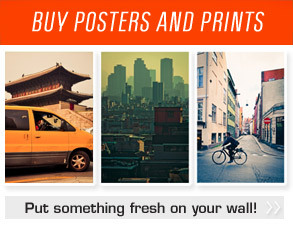 Thanks for sharing so others can consider it when deciding what to purchase.